Figure 1: Team members at the 2017 competition from left to right: Angus Wong (3rd Year MECH), Ichsan Ausri (3rd Year MECH), Zhaowei Huo (2nd Year ELEC), Arthi Muniyappan (Team Captain, 3rd Year MECH), Nicholas Hui (3rd Year MECH), Adil Saldanha (2nd Year ELEC), and Walter Teo (3rd Year MECH). Congratulations to the UBC AeroDesign team, who recently received third place at the 2017 SAE Aero Design East competition. Held in Lakeland, Florida, the SAE Aero Design competition tests undergraduate and graduate students with real-life engineering challenges, and requires teams to produce creative design solutions to these challenges. This year, 40 teams competed in this intense three day competition. In addition to receiving the Elliot and Dorothy Green Award of Excellence for third place overall, the team also brought home first place for their design report, and third place in the highest payload lifted category. The team of 33 students designed and built from scratch a competitive, purpose-built aircraft ready to transport passengers and luggage. Their narrow-body design seats 40 passengers (represented by tennis balls) and completed every flight round with only 1000W of power. 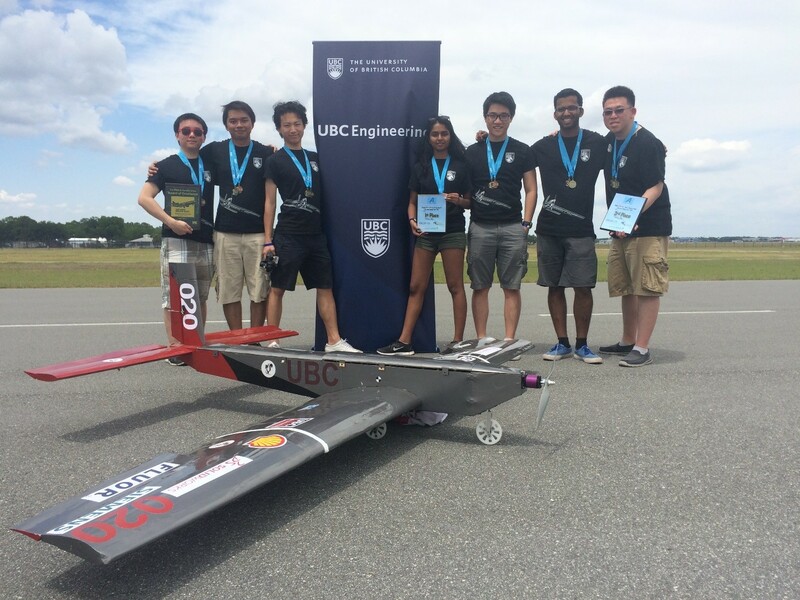 The UBC AeroDesign Team would like to thank Dr. Gwynn Elfring (Team Faculty Advisor) for his support, and Mr. John Siu (Team Pilot) for flying the plane at the competition. The team is also grateful for sponsorship from: UBC Mechanical Engineering, UBC Engineering Professional Activities Fund, Walter H. Gage Memorial Fund, Siemens, SOLIDWORKS, Sierra Wireless, Shell Canada, T2 Systems, Fluor Canada, MISUMI USA, and APEGBC.